Why Buy from TriStar Vet? Our easy-clean veterinary tables, practical dog kennel designs, ergonomic tubs and more are designed for your team’s maximum comfort, safety and ease of use.Consider these 7 important reasons to choose TriStar Vet for your veterinary equipment and supplies. 1 It’s all about supporting your work with efficient, reliable equipment. When your daily routine involves treating all types of cases, you need veterinary equipment that’s built to withstand constant use while offering special features that save your back, reduce cleanup time and keep the workflow humming. With that in mind, our design team works directly with practitioners to see how we can make your work easier. 2 We understand the needs of everyone on the veterinary team. Just about everything we manufacture has been tailor-made for your entire practice. This means every shelf, corner, lift, ramp, drawer, door and other component is considered when developing our equipment. 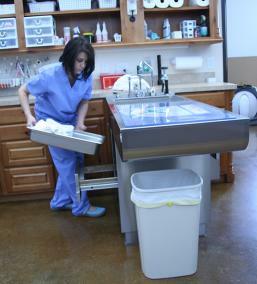 As a result, your staff will save time and effort with our unique, work-friendly solutions such as our one-step hydraulic lift veterinary exam room tables; our patented Water-Flo table – perfect for dental procedures; easy-access dog kennel designs; dog bath and faucet configurations you won’t find anywhere else, and many other inventions that help you provide animal-care services the way you envisioned and as your clients expect. 3 Ergonomics and safety are designed into every piece. Our product design experts are zealots about your daily comfort and safety when caring for animals. We study ergonomics and how your use of our equipment will affect your back, shoulders, neck and more. We strive to help you avoid excessive bending and lifting, especially with large animals. For example, our 800-H hydraulic lift pet bathing tub works from a hand held control, lowered to the ground so groomers can load animals through a door and raise the tub to the most comfortable working height. No more lifting heavy dogs up and over the tub! This is just one example of how we focus on your safety. 4 We build each piece with the most robust materials (unlike other veterinary equipment manufacturers). Everyone claims they make “high quality” veterinary equipment, but we take it one step further. We seek out the best materials, starting with heavy gauge stainless steel that stands tough against years of use… so you’ll never see warping or other problems found with flimsier steel or even laminate. Ask us how you can see the difference for yourself: 877.459.7827 or sales@tristarvet.com. 5 Our welded construction ensures lasting performance. We understand that the equipment’s construction is a key component to longevity. Even the best materials become compromised over time if you use silicone in the seams instead of welding them together… and it’s only a matter of time until you’re making a repair. That’s why we weld our stainless steel seams for long-lasting performance, year after year. 6 We’ll work with you to find the perfect solution for your specific needs. Let’s say your practice’s boarding area wants an upgrade to colorful dog kennel designs. Or you’re looking for the ideal work island to accommodate your busy treatment room. We can work with your team to configure our equipment for your situation. 7 It’s a smart lasting investment for your practice, with equipment that does the heavy lifting for you.